In a note seen by AppleInsider, Katy Huberty from Morgan Stanley predicts that Apple's Services expansion will add up to more than 50 percent of revenue growth over the next five years. Apple's Services revenue incorporates the App Stores, AppleCare, Apple Music, Apple Pay, and iTunes. In its most recent quarter, Apple posted $8.5 billion in revenue in its services category, up 13 percent year over year. At present, services revenue has grown to about $30 per active device -- although Huberty believes that only 18 percent of the users account for the spending. "Over the last five years, the vast majority (86 percent) of Apple's 8 percent annual revenue growth was driven by iPhone sales," wrote Huberty. "It is through monetization of Apple's Services business that we see the company still generating mid single digit revenue growth." 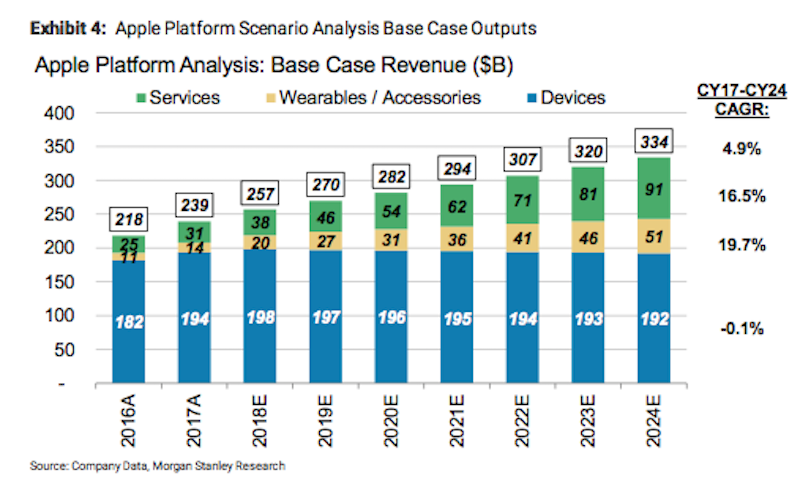 As a result of the Services revenue expansion, Morgan Stanley has set a new price target for Apple stock at $203. Earlier in March, Amit Daryanani from RBC had similar thoughts on the matter. Daryanani said in that report, that any predicted iPhone X softness in the present quarter would be offset by Services growth. Apple's services revenue growth went mostly un-noticed until Apple CEO Tim Cook said in 2016 that he predicted that the segment alone would be the size of a Fortune 100 company before the end of 2017. Apple hit that goal on August 1, 2017, catapulting into 97th place ahead of Facebook's entire business. Apple's future moves in services include a number of video efforts, with a suspected growth of video content budgeting swelling 54 percent every year through 2022 up to $1 billion in total. Any video on demand service anchored by these videos is expected to have a head start with about 75 million subscribers, according to recent predictions on the matter. Does anyone know where the numbers are for how much of Apple's income comes from different products. Growth is one thing, but I'm curious what percentage of actual revenue is from Services, iPhone, Mac, and iPad. It's all fine and good if Services account for over 50% of growth. But if it's still a company mostly getting it's money from iPhone sales then it's not so promising. did you miss the /s at the end? Why thank you! At least I’m in good company! Transportation as a service, provided by the autonomous AppleCar, easily called using Siri on your Watch, AirPods, iPhone, HomePod, or Mac. When did Tim or Luca say this? So like ~60% from the iPhone. Actually I beleive that's better. Looks like Apple is starting to balance out its product line a bit. Still iPhone dominated but getting better. The integration of HW and SW gave Apple a leg up in personal computing. At this point they have pretty much merged into a single experience. The expansion of Services, and their tight integration with the HW / SW, will drive Apple's likely dominance for the next decade or two.